Snow! Yes I have snow! 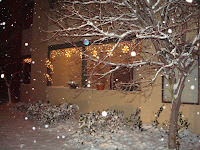 I have it on my doorstep, I have it on my bushes, I have it on my car...I HAVE SNOW! 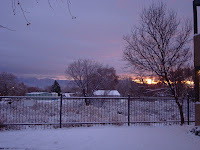 As I mentioned in a previous post, the Westside of Albuquerque doesn't usually see snow. So when I was at work yesterday and the beautiful flakes kept falling from the sky and suddenly turning into 3 inch piles outside the office I was ecstatic. There's something about snow that turns everything into a beautiful serene landscape. This is the time I wish I was a kid again! Our schools are, for now, on a two hour delay, which takes me back to my own childhood snow days. I would wake up, run into the kitchen and have my ears ringing with the words that came out of my mom's mouth, "No school...snow". My brother and would get all bundled up and head out for our first mission, snowman building. But not just one snowman, we would make a Daddy, a Mommy, a Sister and a Brother snowman. The next task was sledding. We used to live by a park that had this huge hill, we actually the park was built kinda like a pit. We'd show up at the park and all the other kids would have these fancy sleds and would make it half way down the hill and come to a complete stop. Well we didn't have enough money for a sled, so my parents gave us an extra scrap of linoleum they had from when we revamped the kitchen floor. All the kids gave us a look of disgust when we pulled out our blue checkered linoleum sled. Chris and I were a little embarrassed at first, but the second we zoomed down the hill like a speed racer, making it all the way to the bottom, the embarrassment quickly faded. Pretty soon everybody wanted to take a turn on our sled! Ah, those were the days! As I'm writing this post they just announced all schools are cancelled, and I just received a text from my boss that we still have to go to work, no delay, no closure. Please, please can I go back to being a kid?! This week's TWD was another great cookie recipe, that I'm sure Santa would LOVE to eat during his busy night of present deliveries. 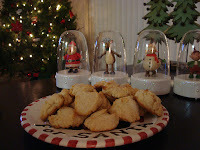 This recipe, Buttery Jam Cookies, is brought to you by Heather of Randomosity and the Girl . 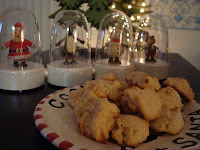 I really enjoyed these cookies, they were light, buttery and the surprise chunks of jam really got me excited! Not only will this be a favorite of Santa's but of favorite of my family, and hopefully yours! Love the snow photos. The cookies look very delicious...your little scene with them is gorgeous. Very nice...lovely job with post, photos, and cookies! Tasty looking cookies. Some loved them. Some didn't. Cookie Polarization. wow, look at that snow! nice job w/the cookies. happy holidays! Thanks for your sweet Christmas card(Elfster secret santa). 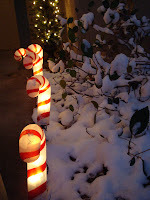 I've added your blog to "my favorites" and I will be a frequent reader :) Happy New Year! Steph - I used to read your blog all the time and delighted in your stories of baking. In fact it was the only baking site I read! I still check back all the time to see if you've posted. What happened? What a fun post- loved the story or your "sled". Isn't that always the way :) My son participated in Boy Scout pinewood derby and made a very very plain forest green car. Sadly, he made it because he wanted it to look like "Mommy's car"..which was a Ford Taurus at the time. All the more embarrassing. All the other kids had crazy pimped out ones and the parents were giving us sad looks....until that little green machine flew down the track. He got a ribbon and we all had alot more fun ! Tricia (FFWD- Tricia and Nana) PS- I love your town and visited it with Nana and our families a few years back. Went to the Golden Crown Panderia (sp?) Mexican bakery and had a blast. The owner was fabulous and spent much time with us PA out of towners. Bought lots of cookies and enjoyed them all.